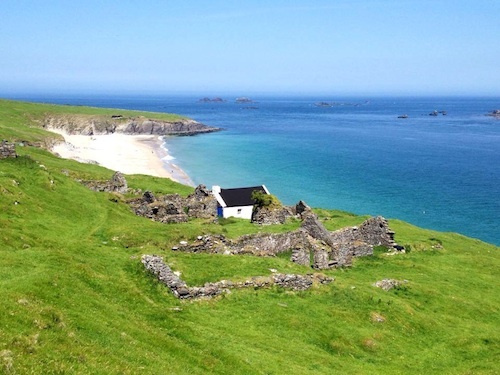 Well, I finally got to go to the Blaskets last year during a spell of exceptional weather (we had 6 whole days in a row of sunshine) and what a pleasure it was to walk (barefoot) in Peig Sayers' footsteps along the green roads of this long deserted but very beautiful island. 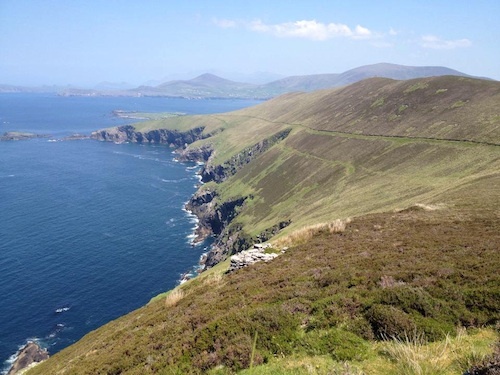 A looped grass walk takes you high above the lonesome houses with stunning views back towards Slea Head on the Dingle Peninsula and the Magillacuddy Reeks on Iveragh Peninsula due South across the water and on out to the dramatic Skelligs. It was all very peaceful and balmy, watching the giant basking sharks filter plankton below the steep cliffs which dropped 100's of feet straight into the sea. The path splits at the 'traffic lights' as the junction with the other side of the island is fondly called even though there are no cars on the island never mind electricity. There is one well but no toilets or even a shop so be sure to bring plenty of water and better still a nice picnic if you are going out there for the day. Even more jagged cliff line the route back to Trá Bán (that white beach) where you can sunbathe or swim (the water is icy) or watch the seals play as they dart in and out of the translucent water. What was left behind though, was a huge wealth of oral tradition about a way of life that is no more, yet it has the timeless allure of all islands, for some inexplicable reason. Being cut off from the world the islanders had to make their own entertainment by visiting each other houses and sharing news. 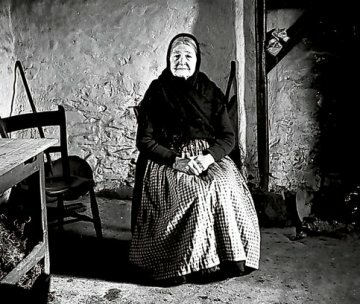 One of most famous was Peig Sayers, a naturally gifted storyteller who was well qualified to speak about hardship, having left school at 14, married an islander and produced 10 children of whom only 5 survived, 4 of which emigrated leaving only her son Michai at home with her on the Blaskets. 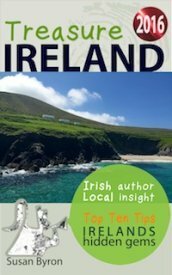 1 Dingle itself once a simple fishing village now a thriving tourist destination that has retained its charm, often signposted in Irish as An Daingean. 2 Murphy's Icecream truly magnificent artisan icecream, people have moved house for their Chocolate Whiskey Truffle and White Chocolate and Rosewater icecreams. 3 Holden Leather Goods in Baile on Ghoilin is another mecca for ladies handbags home produced in Dingle in trendy contemporary designs in the softest leathers. 4 The Greenlane Gallery in one of the best privately owned gallerys in Ireland, excellently curated selection of local and international art & sculpture by owner Susan Callery. 5 Inch Strand if you fancy yourself as ‘Ryans Daughter’ find yourself a Robert Mitchum lookalike and get swept away on this magnificent beach. 6 Connor Pass cross this mountain pass to Kilcummin beach, with its stunning backdrop of the Brandon mountains. 7 Gallarus Oratory and Kilmeader Church in Ballydavid, beehive huts and monastic settlement, dating from the Dark Ages. 8 Louis Mulcahy Pottery great pottery this, whose designs have stood the test of time, still as popular as ever especially the blue glazed lamps with handpainted silk lampshades. 9 Niamh Utsch Jewellery highly covetable handmade contemporary styled jewellery in gold and silver embedded with precious stones. 10 Castlewood Guest House voted best in Ireland by Trip Advisor in 2012. For more information on the Blaskets Centre please click here.